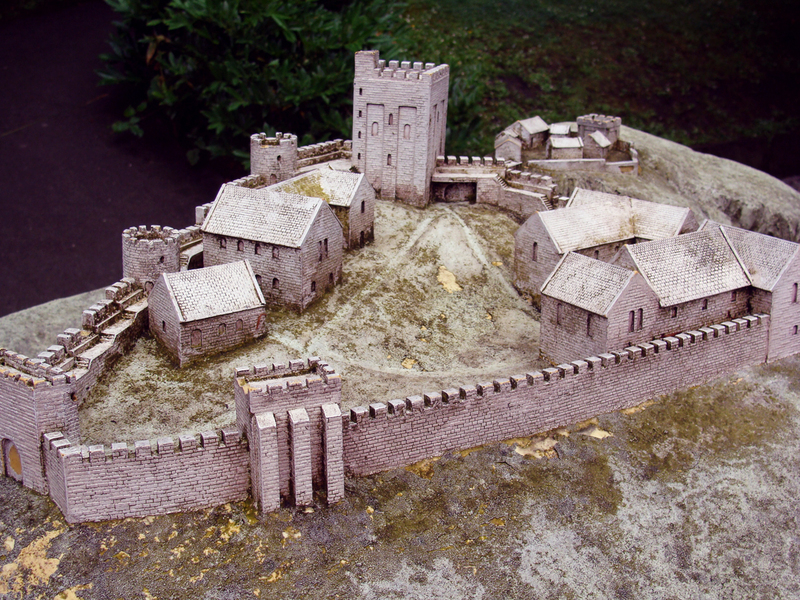 A model depicting how the castle may have once appeared. Today only the keep and ruins of walls remain. My only plans for the day were to do more exploring around Castleton, home to Peak Cavern where I’d been caving the day before. Despite being a mere 10 miles away, I was so often scratching my head while staring at my map and compass that only after about two hours or more of climbing was I speeding down towards the town. I dismounted and locked up near a sign for the National Cycle Network, grateful that I might soon have more to guide me than eyeing bends in the road and my current heading. In the meantime, I hiked up the hill to Peveril Castle. From the keep above Peak Cavern, the Lord of the Forest was able to easily survey his domain and strike an imposing figure of power and potential punishment for violators of the Forest Law. William Peveril, a knight of William the Conqueror, was the first in a long line of Lords or Sheriffs of the Forest. The Norman kings fiercely claimed and jealously guarded a privilege of hunting in wilds unspoilt by agriculture, dispossessing and displacing farmers and imposing a strict code of taxes and fines upon those who ended up on the boundaries of the royal forests. Despite the fact that kings rarely visited the castle to enjoy their hunting rights in person, the privilege was so sacrosanct (perhaps because licensing hunting and pasture rights was big business) that poaching or destruction of Forest for farming could be punished by mutilation and death. These Forest Law policies, antagonistic to all stations of the populace, were eventually addressed during the political upheaval King John’s reign. While the Magna Carta returned all of John’s annexations from Forest to farms, the misdeeds of corrupt and abusive Sheriffs were immortalized in Robin Hood folklore (whose historical basis is rather actively debated). 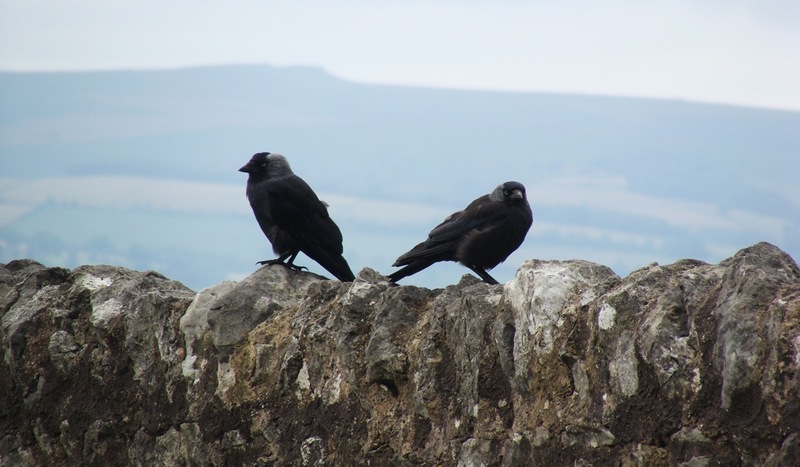 Perched upon the ruinous walls of Peveril Castle. Wondering about what association there might be between this place and any historical Robin Hood, I climbed the keep and had a go at putting myself in place of the Sheriff. A wide sweep of valley lay under my view, and across rose another summit. Mam Tor, the mother hill, so named for its habit of shaking off little landslips and smaller hills. That seemed like it would suit me better than the Sheriff’s station, so I bounded down into Castleton and back onto my bike. Passing more caverns and mines, I found the foot of the Tor, passing an informational sign entitled “The Problem with Mam Tor” and rolling up the road which looked like it wound up in switchbacks to the top. I soon found the problem with Mam Tor. Click for full size image. Though it made the going harder, I couldn’t have asked for a more appealing summit than one in which the road not only twists and narrows, but fractures and dissolves into the stony slides of Appalachia and the lava-like flows of volcanos. After traversing the road, I had only gained a quarter to a third of the hill, so I locked up my bike and took the rest on foot. No switchbacks here, just a direct ascent up a steep slope roughly terraced by the passage of pairs of feet and herds of hooves. As I trudged up on end, the wind rushed up the other. At the top we met, and I leaned into a gust that must have made at least 40 miles per hour, but to call it a gust wouldn’t be fair to its constitution. The entire time I stood atop Mam Tor, I couldn’t hear for the howling effort of the air trying to lift me off and carry me away as a prize. Unfortunately I had no time for such invitations. It was well past noon now, and given my pace I was already anxious about the fifty miles that remained between me and my train. Though a twenty mile route was still an option at this point, I turned my back on it and took my bike in the opposite direction, towards Blue John Cavern, filled with a unique fluorite, and Chapel-en-le-Frith beyond. My mind wandered into the Blue John mines, wondering what I’d missed, while more beautiful landscape blurred before my eyes. I put my head down and pushed, but it wasn’t easy going. Besides hard climbs and unclear signs, the topography made it hard to navigate with my map’s level of detail. And I was very wary of missteps, which could easily lead me to needlessly putting in hundreds of meters of work against gravity. My attitude edged against itself – “You got yourself into this impossible challenge.” I jibed or chuckled with each climb or coast, and once had to shake myself back to liveliness after nearly wiping out on an approximately 25 mile per hour descent (judging my speed against nearby cars) due to an unseen obstacle in the road. 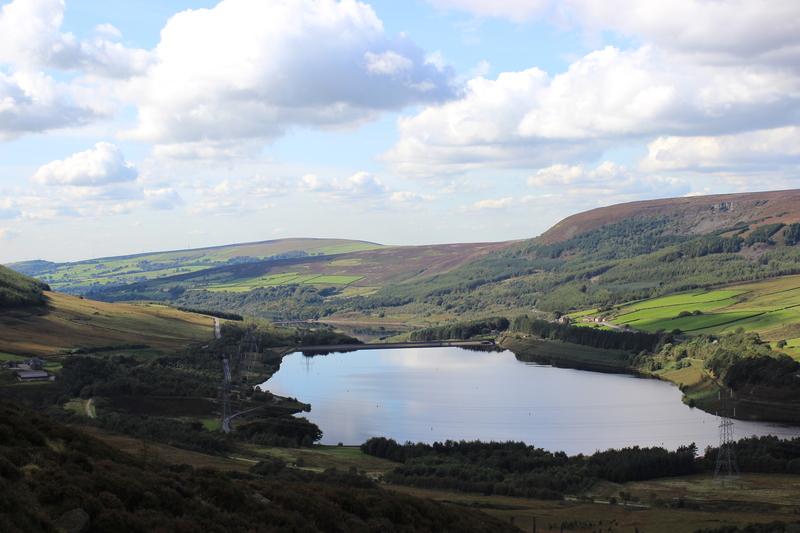 Eventually I hit the Longendale Trail, which follows an old rail alignment along a chain of reservoirs and rivers. With flat trail under my tires, I put on some speed, which was shameful given that the valley reminded me of the Columbia River Valley, one of my favorite places I passed through during my roadtrip across the US. I hustled, hunched as far forward as possible without drop handlebars, over pavement and gravel onto hard packed dirt and loose pits of stone. Then, to my dismay, I started climbing again. Contrary to the long steady descent I’d been promised by a website claiming to retrieve altitude data along my Google Maps route (which may mean that I climbed more or less than 1600 meters over the course of the day), I was now puffing up off-road hills for seemingly little reason other than the maintainers of the trail thought it would be good fun. And they’re probably right! But with just an hour to go before my train would leave Sheffield and the last sign post reading 10 miles left to go, I was a bit irritated. Finally I descended out onto a road, where a man with a dog and a face tattoo gave me directions to the highway I was looking for. “Why is it that I’m always getting directions from men with dogs and unusual tattoos?” I wondered while navigating a detour from the passage of the Tour de France just a week before. And while I didn’t have the chance to sit down with a victory pint for a day of hard pedaling, and while I wasn’t even really victorious since I missed my train while searching for any sign indicating the rail station, and while I wasn’t even sure what good the over-ambitious route had done me without the chance to savor more than 10 miles of it, I at least caught a comfortable seat on the next train and settled into a nap that my stressed and stretched body and brain greatly appreciated.